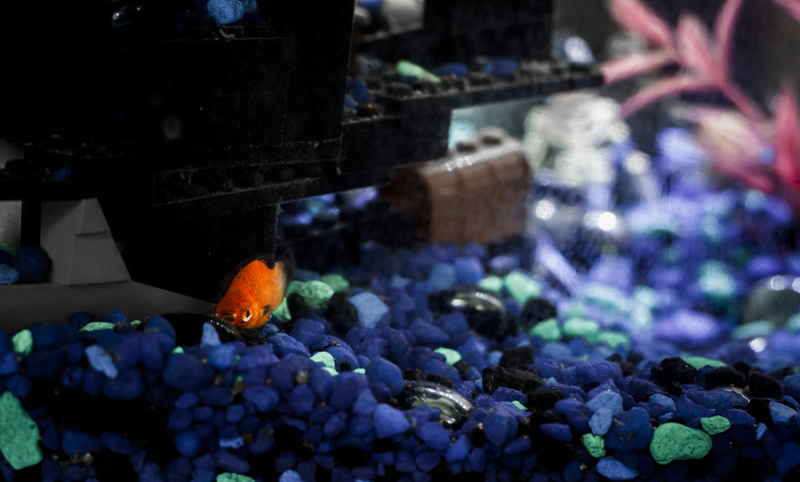 This weeks challenge was to take photos of my fish. Now you may be thinking to yourself, "how is that challenging at all". While it seems easy on the surface, it's a lot harder than you think. As you can see here, mine didn't turn out very well. There's a whole slew of reasons why and don't think I'm just making excuses either (HA). Whenever you see really nice photos professionally taken of aquariums and the fish in them, the first thing a photographer will do is put them into a thin-walled aquarium. Most aquariums have pretty thick glass; this thickness is to withstand the pressure of all that water inside them. The bigger the aquarium, the thicker the glass gets and this glass in turn creates distortion. With a thin-walled container you increase the risk of the tank breaking, but it works out well for short photo sessions to get better shots. Another problem I ran into is that the lighting is pretty bad, but I can't very well whip out my 2400 watt, 41,600 lumen giant hot lights to get better lighting. Doing that would put the fish into shock and also heat up the tank pretty fast. Since fish are cold blooded, if the temperature fluctuates too much, they won't be able to handle the change and start dying off slowly. There's also the problem of them being fish. Unlike still life or people, you can't direct animals, especially fish, very easily. When you're working under low lighting conditions, your shutter speed generally suffers and fish are pretty fast. We also have little guppies; most of our fish are only about 2 inches or so, except our loach. Working with something so small and so fast is tough enough, but I also don't have a macro lens either. Without a macro lens, I can't get very close up unless of course I use my "close up filters". Then you start introducing even more glass into the equation and your aperture closes to something insane like f22 to even get something sharp where enough is in focus. If you or the fish moves even slightly, it's back to manually focusing. Now again, this isn't me complaining, I'm just documenting my challenge as this is the whole purpose of it. Now If I was shooting at a giant aquarium with adequate lighting that the fish are used to and you aren't taking a photo of a 2 inch fish, it would definitely be much easier. Regardless that was my challenge this week. Next week's challenge that I was given is to take something ugly and make it look beautiful. So we'll see how that goes.